Brentham Garden Suburb in Ealing, west London, is no ordinary group of 620 houses. 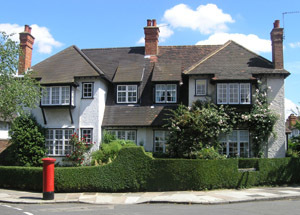 The first garden suburb to be built on 'Co-partnership' principles and an inspiration for the later, larger and more famous Hampstead, it has made a mark on twentieth-century domestic architecture, town planning and social housing out of all proportion to its size. The Labour, Co-operative, Arts and Crafts, and Garden City movements are all part of the Brentham story. The suburb was designed to a plan by the leading garden city architects Barry Parker and Raymond Unwin, with houses, mostly in the Arts and Crafts style, by George Lister Sutcliffe and Frederic Cavendish Pearson. In 1969 Brentham Garden Suburb was designated a conservation area.